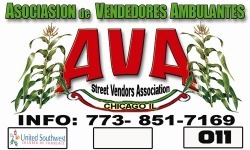 As a result of constant attacks by inspectors and city officials, the Asociación de Vendedores Ambulantes (Association of Street Vendors, AVA) formed in 1992. With courage and sadness its members remember when city inspectors threw their products in the garbage or them doused with Clorox. Today, with new hopes, strength, and expectations, Chicago street vendors have come together once more. AVA's goal is to unite in solidarity in order to create a world in which street vendors work under reasonable regulations and are allowed to live with dignity. CAAAELII supports the development of immigrants and refugees to act as agents of change in their communities. CAAAELII employs participatory approaches that embody the human rights framework. Its programs provide the support necessary for immigrant and refugee communities to develop collaborative projects and issue based initiatives as the foundation for community building.